As always, deer camp chores were in abundance. Getting ready for the upcoming flux of hunters was tugging at my conscious of heading north to take in the fall colors. Then along spoke my wife, Becky. “Hey, how about if I tag along with you this trip?” My response was much like Tim Taylor on the TV series Home Improvement. Becky sensed my surprise and doubled-down by making arrangements to take a couple days off work…making our excursion a ‘looong weekend’. While we began to pack-up to head north I began my full disclosure to Becky. I explained that I had plenty of work to do and two bow hunters for the weekend. Her grimace was shortened when she learned they were expecting only hunt spots and not food and lodging. She made it clear she was not going to be the chief cook and bottle washer. Her response was wrapped up by insisting we would take that short trip to the Tahquamenon Falls area. I agreed…fall colors would further beautify God’s Country. And, ‘the falls’ has a highly recommended restaurant and brew pub. Go figure! Our drive north of here was a beauty. Seems we drove through a color tunnel most of the way. It sort of reminded me of the Tunnel of Trees just north of Harbor Springs. Yes, I know, much less of a tunnel, but a reminder, nonetheless. Our last half an hour seemed to be the peak of it all. As we drove onto the two track serving East Lake the deep blue water contrasting the hard maples, beeches and tamarack was spectacular! I often have thought this is God’s way of having us saying our goodbyes and hellos to the changing seasons. It is definitely a time of reflection for me. Becky and I were not at camp long before I unpacked my chores list…namely bags of feed for our lesser populated white-tailed deer. We decided to get outdoors as soon and as much as possible. The conditions out-of-doors were near perfect. As we mapped out our itinerary I promised her most, or all, of my walks back to deer hunting spots were as good as any hiking trail. She stared at me studying me for any evasive gestures signaling my embellishment…but, there were none. None, because it is how I look at a walk in the woods…thus, my conscious was clean. The walks served several purposes. By the time our final deer hunting spot was visited & refreshed, so was I! Our return to the cabin was timely for a hearty lunch. It also gave me a clue that the hunters have arrived a little early and were eager to decent into the woods. Becky admittedly enjoyed the walks to the hunting spots. With nature in abundance we were both entertained. This led to the next day’s planning. 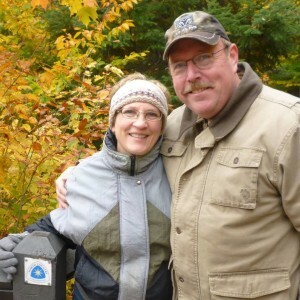 The hunters were only able to take to the woods in the afternoon, so it gave Becky and I time visit Tahquamenon. We talked about our previous visits to the falls, which were all in the summer, and we were looking forward to the autumn splendor. We were not disappointed! 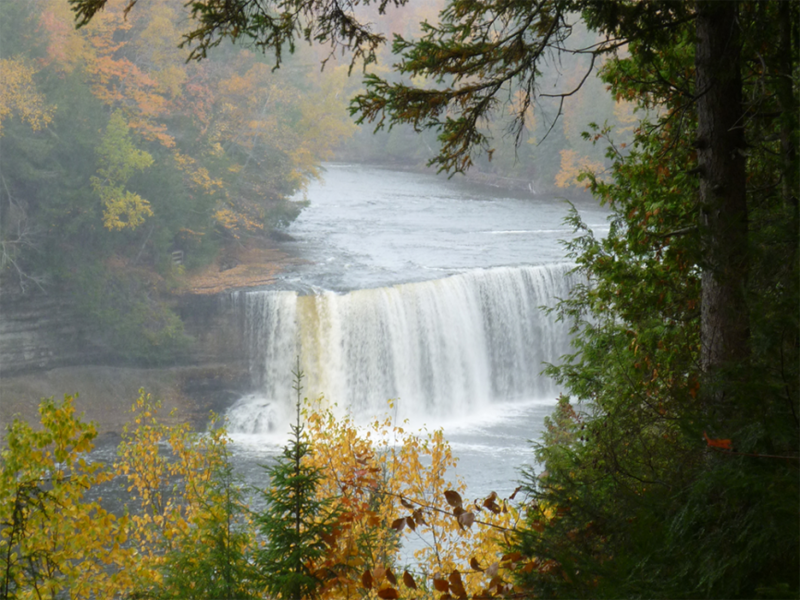 The Tahquamenon Falls in the autumn exceeded our expectations. As we began our hike on the boardwalks and steps leading visitors to different viewpoints we noticed the wonderful ‘blue blazes’. These strips of blue paint were something of familiarity to East Lake neck of the woods. They were signs indicating the North Country Trail has a sections of its groomed pathway meandering through an area of Tahquamenon. Becky and I could not resist ourselves in asking a fellow visitor to snap a picture of us with a NCT placard. As I have viewed the days collection of prints I am awed at what a collection of volunteers can accomplish year in and year out. Coordinated by Stan and Kay Kujawa, the North Country Trail, namely the Hiawatha Shore-to-Shore section (NCT-HSS) is continually maintained and promoted for all to enjoy! Like Kay says, “nature’s health club”. Recently Kay Kujawa was given recognition for having volunteered 10,000+ hours in efforts to maintain the NCT-HSS. Our hats off to Kay and her husband, Stan. We appreciate your dedication in making sure our health club facilities are kept up to standards.